Aviator Squirrel Shirt for Men from Headline Shirts. You can buy this shirt here. Amelia Earhart ain't got nothin' on this aviator squirrel. You can show your love for honey gliders, flying squirrels, ground squirrels, and just your everyday rodents with this funny tee shirt. Classy, stylish, and hip to boot. Unfortunately, this shirt is only available for men, and does not come in other styles or colors. With some luck, they will expand the line. When and if they do, we will update this post appropriately so you can locate the shirt. If you like yellow, though, and can sport a men's shirt, you are in luck! 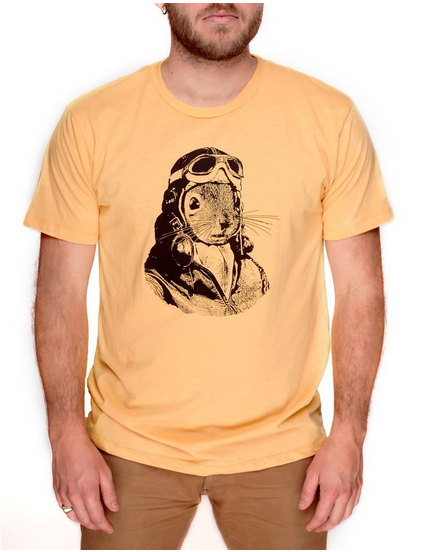 Aviator squirrel will be your best shirt ever.